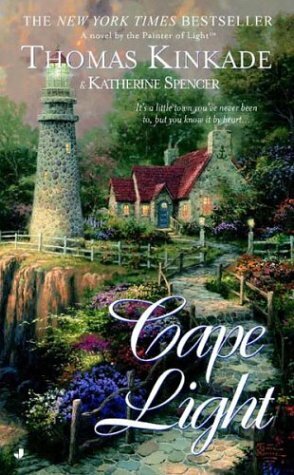 Inspired by the artistic vision of world-renowned landscape painter Thomas Kinkade–and imbued with the light of his uplifting message–this heartwarming novel introduces us to the quaint town of Cape Light, and those who call it home. I picked this book up at our local library books sale for 50 cents. I had no idea that Thomas Kinkade had helped write books, so this series was totally new to me. They had the first two books in the series for 50 cents each, so I figured they were worth getting. If I didn’t like them I was not out much. I ended up enjoying this book. I don’t read a ton of fiction, novel type, books so this is not my normal type of read, but I enjoyed it for something different. It was an easy read. It was a pretty typical, somewhat predictable, Christian romance type book though.